"It is with no small degree of embarrassment that we confess to not appreciating the charms of Verdi's final opera--not until tonight, that is. Under the stewardship of Artistic Director Martina Arroyo, the program Prelude to Performance once again provided a matchless evening of entertainment, fun, and artistic merit to a delighted audience as well as performance opportunities to young singers at the cusp of major careers. Now how does she do all this???? By doing what the Metropolitan Opera, with all its vast resources, cannot. She hires the best talent in the business to coach and direct the young performers in a concentrated program; the ensemble feeling is evident from one moment to the next. " The above is a quote from our review of Prelude to Performance's Falstaff ... from 2012, when we had just begun Voce di Meche. Our opinion of last night's performance is no less enthusiastic. As a matter of fact, one aspect was even better! In the intervening six years we have come to appreciate the opera more and more, having enjoyed productions at Juilliard and at Dell'Arte Opera Ensemble. What distinguished last night's performance was the conducting of Maestro Richard Cordova. We were so impressed by his insightful and detailed reading of the score that we went backstage to speak with him. We learned that he studied the score long ago with Maestro Carlo Maria Giulini and it has remained one of his favorite scores. We heard features of the orchestration that we had never heard before, for example, the way the sound of the oboe and the English horn (Slava Znatchenii) knitted and purled around the quartet of female voices in the "laughing" ensemble. Verdi's late life masterpiece revealed similar features in generous measure from one moment to the next. We have heard moments in Puccini's operas in which the orchestration imitated or underscored the onstage action, but this is the first time we heard it in Falstaff. Our ears were opened to new insights! The superb musicians were provided by orchestra contractor Marc Szammer. We began by mentioning our own learning experience but do not mean to shortchange the singers who were uniformly excellent. 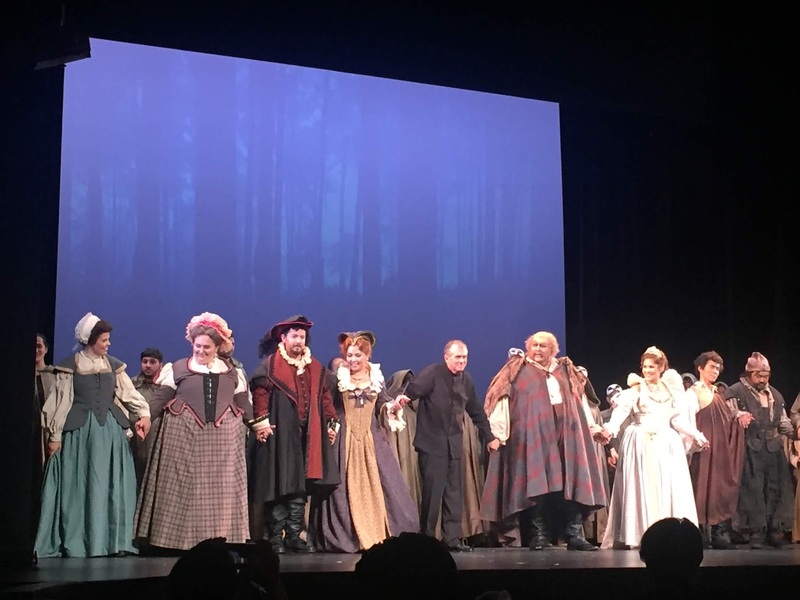 Falstaff can't work without a larger-than-life artist to portray the titular character and José Luis Maldonado more than filled the bill (and the costume). We think the last time we reviewed him we called him a beast onstage. Great artists need more than a great voice; they need a stage presence that pulls the audience right in and this he did. He was, in turn, arrogant, deceitful, pompous, entrapped, humiliated, and abashed. The four women who plotted his humiliation were each superb, but together they were outstanding. Nina Mutalifu's Alice Ford was well paired with Molly Burke's Meg Page. As Mistress Quickly, Emily Skilling got to perform one of our favorite scenes, approaching the Fat Knight with ersatz politesse-- "Reverenza!" This has been running through our head all night long. In the role of Nanetta, Maria Brea made a fine showing. Her Fenton, Te Yu Huang, stepped into the role at the last minute and truly rose to the occasion. If it were difficult for Ms. Brea to accommodate to a new Fenton, she did not show it. The pair provided "romantic relief". Gerardo de la Torre made a fine Ford and delivered his aria with fine voice and style, earning a big hand. Kyuyoung Lee created a different kind of character, the ridiculous figure of Dr. Caius to whom Ford plans to marry off his daughter. Ian Campbell's direction was first rate and happily kept the action in the time period and place in which it belongs. We really liked the way he handled the final scene in a somewhat understated manner; it is usually overdone. Charles R. Caine designed the opulent and period accurate costumes which we believe we remember from the production of 2012. Steven Horak's wigs and makeup were well suited to the cast. Sets were simple and augmented by projections on the rear wall, for which no one was credited in the program, but Dante Olivia Smith's lighting worked well. The excellent chorus was conducted by Assistant Conductor Noby Ishida. In sum, we can't remember having a better time at this opera than we did last night. We don't need "concept". All we need is a coherent production with great voices and orchestral clarity. We left Kaye Playhouse sort of dancing down 68th St.